Shaken, not stirred: The Need for Speed !! The Need for Speed !! In the early nineties, a Japanese Business delegation visited India to explore investment opportunities. There were the usual cultural shows and a visit to the Taj Mahal, among other things as part of their itinerary. An interesting part of their visit was a train journey from Mumbai to Pune. The journey was largely uneventful and took between three to four hours. After reaching Pune, one of the members of the delegation curiously enquired about the total distance between the two cities to their Indian host accompanying them. “It would be anything between a hundred to a hundred and ten kilometres.”, the Host replied. The host did not have any answer to his visitor’s claim. But the conversation does open up a new and radical line of thought. What if an ultra-high speed train service was to exist between both cities? And what if it were to exist between all major cities in India? India ranks among the largest railway networks in the world with a staggering Sixty Seven thousand three hundred and twelve kilometres of route covered (source: Wikipedia). Given the huge size of our country along with the extent of our railway network coupled with high demand and traffic, it is very surprising to know why High Speed Rail (HSR) networks were so long in coming to India. One only wonders why it took so long for the authorities to wake up. After all, major countries including China have developed their own HSR networks. Why should we fall behind? The Indian Government’s recent announcement of setting up a High Speed rail network in the ultra-busy Mumbai Ahmedabad route comes as a welcome relief after years of speculation and false promises. Of course, Rome was not built in a day. Feasibility studies are ongoing. Other viable routes are being studied and it will be some years before dreams materialize into reality. But anyhow, it’s a step in the right direction. Towards progress. And let me illustrate how. The Mumbai Rajdhani Express, the fastest train in the Mumbai-Delhi corridor and the third fastest train in India covers the distance between Mumbai and New Delhi (1384 kms) in an average time of Fifteen hours and forty two minutes. Imagine how wonderful it would be if the travel time between both cities is reduced to a mere four hours. The Super-fast Mumbai Ahmedabad Shatabdi Express covers the 500 kms distance between both cities in an average time of Six hours and forty five minutes. What if the travel time between both cities would be reduced to a mere one and a half hours? 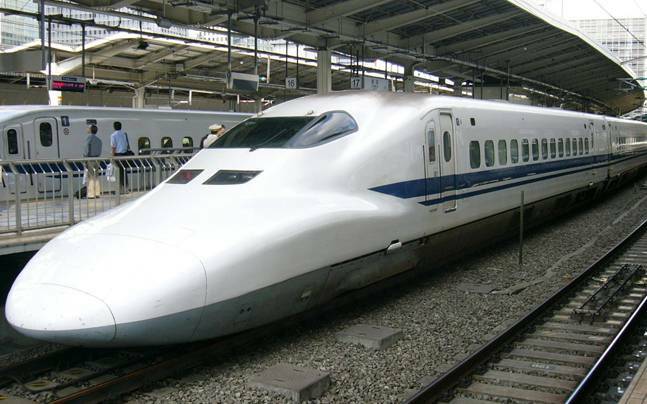 The Japanese 'Shinkansen' model bullet train. Time saving and speedy travel is just the tip of the iceberg. There are other inherent advantages. Let’s say a person Mr. X is a Computer Engineering professional who stays in Mysore. Due to a local paucity of jobs he finds suitable employment in nearby Bangalore. It takes two to two and a half hours for him to travel between both cities one way, something which is not convenient on a daily basis as his job demands that he work hard and stay long hours. Therefore, he is forced to take up accommodation in Bangalore. Accommodation is expensive as rents in Bangalore are sky-high. But given his situation, he has no other choice. His tale is similar to that of many young engineers in his position who are forced to stay in big cities like Bangalore, adding to the growing number of residents in the city. This in turn puts immense strain on civic authorities to provide basic amenities such as clean drinking water, public transport and sanitation to cities with a burgeoning population which are already oversaturated. More number of people in the city also means more crowds, more security hassles, more vehicles and more pollution. But imagine if the situation was reversed. What if there was a high speed rail network running full time between Mysore and Bangalore which took only fifteen to thirty minutes to complete the journey? Now Mr. X can happily live in Mysore, take the morning train to Bangalore and work till late. He can return again by train in the night, just in time for a steaming hot delicious dinner after which he can sleep easy and get fresh for work the next day. Now he is no longer on the mercy of greedy landlords who charge ultra-high rents for sub-standard accommodation. He no longer has to face the merciless travails of living in a big city such as traffic jams, high cost of living, congestion and poor cleanliness, among others. As illustrated above, introduction of HSR networks have huge potential for benefits in terms of reduction of travel time and other advantages as mentioned earlier. But if the HSR network only connects the big cities, then it would be a task incomplete. We should actually connect smaller towns and cities to major metros via HSR. As mentioned earlier, most of the jobs are concentrated in these major urban areas. People living in small towns are forced to migrate to big cities in search of employment and stay there despite the many pitfalls they will face. Introduction of High Speed trains between small towns to big cities will greatly reduce the travel time. People will now be able to live and commute easily from their home-towns without getting uprooted. This means fewer people will now migrate to bigger cities. This will bring down the already swelling population level in metros. This in turn, will reduce the congestion and pollution which currently plague all big cities in India. This shift in demographics will also force the Government to now concentrate its’ development on smaller cities. Overall, it’s a win-win situation. But there also lie major challenges in HSR implementation. Cost is the major factor. Current studies have indicated that it would not be feasible to setup HSR networks on existing railway lines, as our current track setup is not stable enough to support a high speed train traveling well in advance of Three hundred kilometers per hour. Therefore, a special elevated line is planned to be constructed for the same. Costs of constructing such an elevated network spread across many hundreds of kilometers will run into thousands of crores of rupees. Ticket pricing would be another major challenge. Tickets should be priced low enough for the common man to not feel financially burdened to travel by HSR, but at the same time be competitive enough to enable the government to recover its’ money fully and start making profits in a relatively short span of time. There are other hurdles as well such as setting up the related infrastructure, land acquisition etc. which could take up a huge amount of time and resources considering red tape and how lethargic government processes generally are. But our newly elected government is citizen centric and is eager to win the trust of the people by speeding up processes and removing unnecessary hurdles. Of course, no cost is too high to make your citizens happy. But then again, not everyone will be happy with the introduction of HSR. The thriving domestic airline industry will surely take a hit. If the HSR tickets are priced competitively, making it within reach of the average middle class salaried person, people will surely prefer travelling by train rather than flight. Airline Companies would be forced to lower prices in order to stay afloat. Many will resort to lay-offs and ruthlessly cut corners in order to add revenue and make their business sustainable. Those who will not be able to do so will have to shut shop. Also in the not-happy-with-HSR list will be real estate agents and brokers in big cities, people who have been making a tidy living of the earnings of hapless people by charging exorbitant amounts in rent and brokerage. That will be due to the fact that speedy means of transport by HSR will ensure fewer people are forced to migrate to big cities, which means fewer customers. Demand will fall, rates will crash and builders will have to target smaller cities. Whatever the pitfalls and challenges are, HSR’s are surely a step in the right direction. Change is inevitable, no matter what the cost. And this change has been long in waiting. History has taught us that those who have adapted to change and have accepted it have been the ones to survive and prosper. But there is a very wide line between expectations and reality. How soon and how effectively the government delivers on it’s promises is yet to be seen, but for now one can only be contended waiting … and dreaming !! Here’s my artistic impression of how the proposed HSR network should look like across India. Sorry for the crude map and haphazard lines. 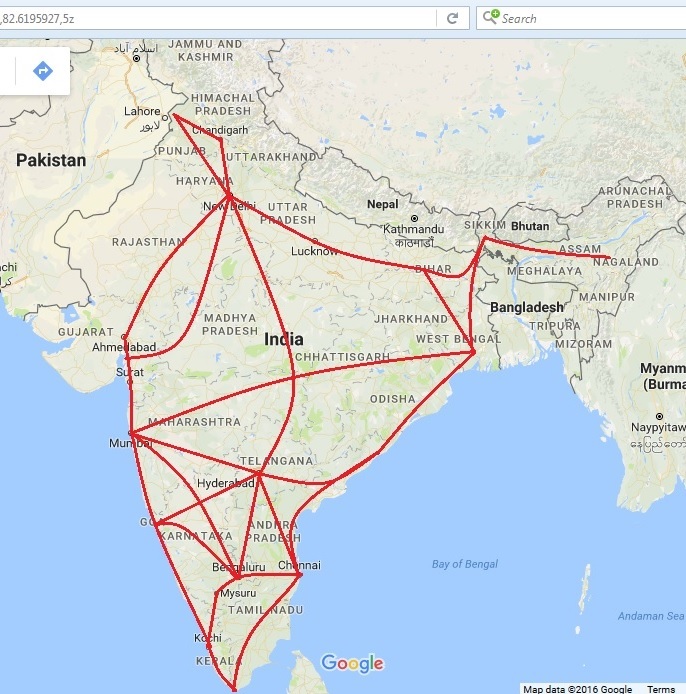 For now, I have only connected the metros and major cities of India. But time permitting, I will add detailed regional maps soon. A note for my brethren from the North-East(NE): Apologies if you see the NE region not included in the high level map. I have very little idea of the topography and the locations of the capitals and major cities of the seven sisters. As I said earlier, time permitting I will add more detailed maps and the NE region will definitely be included too. In fact, I urge the government to also consider the NE in the scheme of things for HSR. Of course, it goes without saying the government will consider the NE much, much later as they will first concentrating on introducing HSR in the mainland first. But surely, our brothers and sisters from the NE deserve it. For too long have they been isolated from the growth and development process of the country. Any positive change towards progress should also include the NE, else the process will not be deemed complete. There are major challenges which lie in implementing HSR in the NE; the main one being the rugged and mountainous terrain which will impede speedy construction. But the task, no matter how daunting it may seem is definitely not impossible. Countries having similar landscape to the NE such as Switzerland have implemented effective rail networks despite the physical challenges, so I don’t see why it should be any different for the NE. In fact, planning and executing this task could be just the challenge our nation’s engineers are waiting for. If planned and executed smoothly, the HSR in the NE region could be one of the world’s foremost engineering marvels. Another engineering marvel would also be accomplished if we build these HSR networks ingenuously rather than depend upon foreign nations for technical know-how. That again is a daunting task, but nothing challenging or rewarding comes easy. True, we might need their technical expertise initially, but later on we need to phase out and start building our own. Edit: One of my many friends in Facebook dropped an interesting comment for this post. Repeating my friends' words, there is no point for Mr.X to travel 100 km from Mysore to Bangalore in under 30 minutes and then get frustrated for traveling for over 2 hours to reach his office 20 kilometers away from the train station, given the current state of Bangalore's traffic. Of course, it goes without saying that local and regional development have to go in step with national development. Well, that’s just my two cents. Comments and criticism are most welcome.